I have decided to put all my blogs and websites together into one. So now you can visit my new website and get all the info there. There is a chance now of signing up for a newsletter which will bring news, tips and special sales just for those subscribed! Tambien he decidido abrir la posibilidad de anotarse en un boletin de noticas o newsletter. Para que todos aquellos que lo hagan, recibiran un email mensual con tips, noticias, avisos de sorteos y liquidaciones especiales. *For orders via my Dawanda shop , just add: "red tanseys" on the note to seller while checking out (easier than having to go product per product changing the shipping costs...thanks!). *Private order? you ask... well, checking out my website or shop you can see my work. 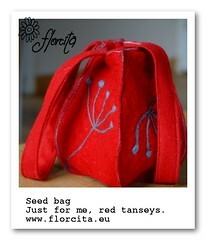 You just have to drop me a line: info@florcita.eu saying what you wish and I will send you a money request via paypal. Simple. It all comes wrapped with silk paper and with a nice ceramic tag included. 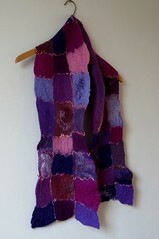 Hand felted scarf in beautifully soft shetland wool in natural colors. 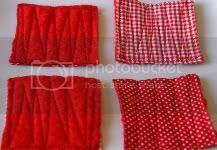 This technichque creates a lovely light scarf with holes and chequered patterns. Very laborious but gorgeous results. This one was handfelted with soft white merino wool and the leaves done in three different tones of brown which have delicious names: custard, mustard and caramel! 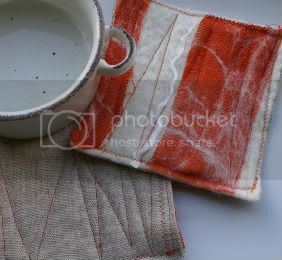 The ceramic cup was made by me as well. Autumn is starting here in the northern hemisphere, and nothing better than a warm cup of tea, sitting on your favourite spot in the couch, watching a movie, reading a book...taking a nap... and for that a nice, warm wooly blanket. 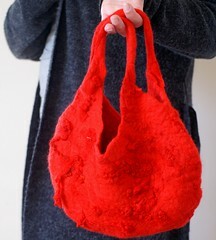 All handfelted, no sewing, in soft merino wool. 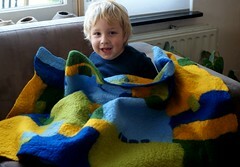 My son loves it... I might need to make a few more of this! 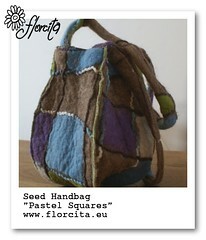 Using merino wool for the squares, yarn and russian coarse wool in camel hair color... here is the "Pastel squares Seed Handbag". There is a nice description and more pictures in my DaWanda shop. 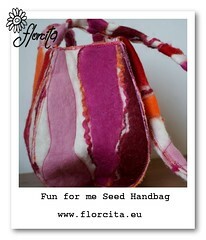 A new bag, colorful and chic, "Fun for Me", from the same collection. In the shop, many more pictures and a good description! Work for the weekend! some hand dyed fibres to spin! I am loving my spinning wheel.... cotton, bamboo, merino and silk! Soon in the shop! 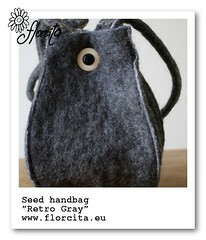 The " Charcoal Grey seed Handbag", another bag from the new "Semillas- Seeds" line; was wet felted with the softest, lightest merino wool. It is lined with a black cotton fabric. I think this one is particularly versatile for night and also day use. You know... easy to combine. 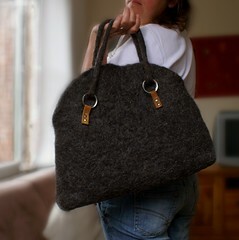 The "Charcoal Grey Seed Handbag" is listed in my dawanda shop now where you can see more pictures which will illustrate better what I' m trying to say with words! 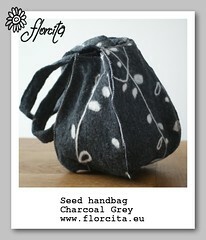 I have a new line of handbags " Semillas" or " Seeds" coming out. This one, " Natural", is the first one. 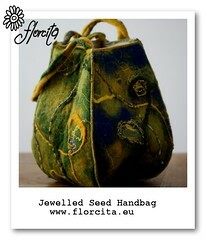 Inspired by the seed pods of Lilys and other flowers that grow in my own garden. 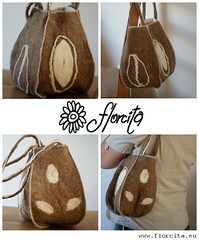 Natural: This bag was handfelted using Russian, camel hair coloured, coarse wool for the base. 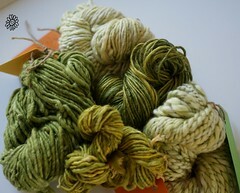 Natural merino wool and merino handspun yarn were used for the seed/leaf designs on each of the 4 sides. All different. It is lined with off-white cotton canvas fabric and reinforced on each edge for extra sturdiness. The straps are made of the same materials. I fit my cell phone, wallet, reading glasses, keys, coin pouch and little moleskine in it... with space to spare. You can see on the botton right corner pic how it looks when you hang it on your shoulder. That ussually gives a better idea of an item's size than plain measurements. 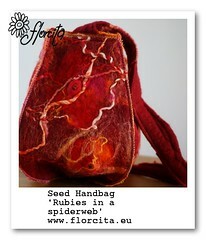 The "Semillas- Seed handbag. Natural" is listed in my Dawanda shop now. You can email me if you wish to purchase it without logging into any e-commerce platform or if you want to see more pictures. It is customizable, of course. You just have to contact me, following the contact button on the left hand menu! More colors and surface design in the days to come! Seed pods yellow green merino seed beads yarn hand dyed hand spun felting, water wool linen fibres blue bamboo shine yarn spinning wet felting florcita.... new. We are back from our vacations in Noord Holland. It was cold and it rained but we still managed to have a good time. Now back to work! Lots of goodies coming up! Volvimos de nuestras vacaciones en Noord Holland, una de las provincias al norte de este pais. Llovio e hizo frio pero igual la pasamos bien. Ahora, devuelta al trabajo. Muchas cosas buenas se avecinan! To those of you who might be interested in reading what I have been up to or planning to bring to the shop in the near future, a little reading. I was interviewded by Sara (Sara's Texture Crafts ) for DYI magazine which is an online magazine full of resources and links of artisans, suppliers and all around DIY stuff. Busy busy harvesting the first produce... and eating it. There is an incredible satisfaction in growing your own food. And sitting under a tree to eat freshly picked cherries.... nothing beats that! 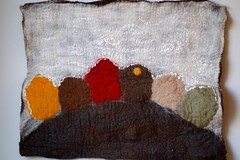 A new version of an old image combining felt and fabrics. In the Dawanda shop! Clicky here for my review, full of pics, of a workshop with Karoliin Arvilommi and Rod Welch. Have I mentioned my mantra lately? : "Experimenting, that is how we learn"... well... guess what... that's is what I've been doing. I'm not sure what precisely will become of this textured pieces but it was interesting to practice them, learn a bit more about them and the material. I have a couple more done but those will become cushions... as soon as I, first, find a torche...oh yeah... playing with (wool and ) fire now. 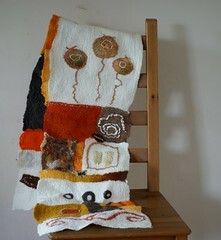 the combination of glass and wool... always fascinating how one provides structure and texture and the other one, light. Details of an abstract wall hanging. I was not trained as a seamstress so when I found out that with handmade felt you could make garmets without sawing, I couldn't believe it! it still requires a certain degree of understanding of the wool...and practice... lots of practice. I wanted a sort of Jackie O jacket: to the waist, 3/4 sleeves, simple, kinda trapezoid shape. I will add a button later (maybe one of those ceramic buttons I made some time ago). A yurt is a typical portable handfelted tent from Central Asia. 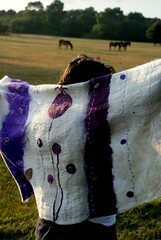 When my husband saw my sketches and the first layer of wool, he thought I was going to make a tent... it was rather big! I'm happy with it. Naturally I know I have lots to improve... but this is a start. I have plans for more later! Happy eastern to all of you! Have a nice weekend! 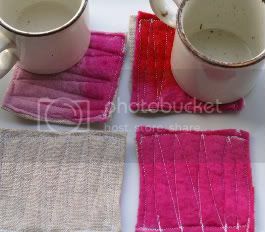 A quick addition to my shop: some coasters combining hand made felt and cotton or linen fabrics. Fun, colorful, washable and easy to stack away. Different colors and sizes! And affordable! Small little plates made of terracota and painted with blue, green and yellow engobes. Going to the kiln tomorrow... can not wait to see the outcome! 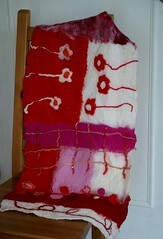 Another wall hanging. 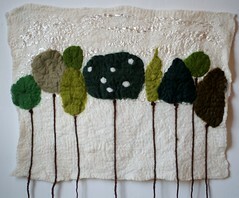 This one is called "little forest". 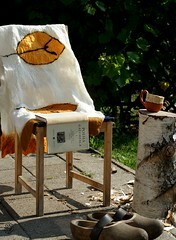 It was hand felted with merino wool and tecel (a derivate of wood pulp). It's 56cm x 41cm. The trunks of the trees hang out of the piece itself, as you might notice. My photographs have been having a lot fo success among the experts ;) So I have added a few selection of them to my prints shop: en.dawanda.com/shop/florcitasart and my shop here too! Mis fotos han tenido mucho éxito entre los entendidos :) Asi que he agregado algunas elegidas a mi negocio de impresiones: en.dawanda.com/shop/florcitasart y mi tienda aqui (vea el link a la izquierda). the sun is shining today and the temps are going up... 5C now... which is a lot compared to the -17C of last week. We are still outside, playing with the snow, enjoying how magical and silent the world becomes when it is covered with a thich white carpet. 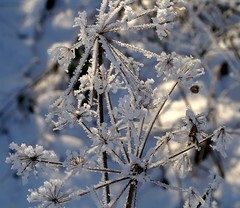 Winter and its magical, frozen world. No, it's a rose dipped in sugar... that is ice! This glass bead is the result of a workshop on lampwork in which I participated a few months ago. It's white and red glass with a layer of transparent glass which is all textures!